If you’re feeling the pinch of ever-increasing cellphone bills, wireless provider FreedomPop would like to have a word with you. Starting today, the company has begun offering mobile phone plans including data, text and voice for the astoundingly low price of absolutely nothing. 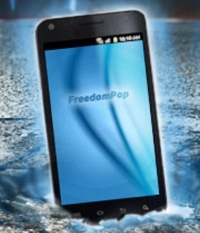 That’s right: FreedomPop is free. Predictably, there are a few catches, but none of them are necessarily deal breakers. To use the service, you’ll need a Sprint Android phone that’s currently out of contract. If you have your own, you can sign up for free; if you don’t have a Sprint phone like the HTC Evo 4G, you can buy a refurbished one direct from FreedomPop for anywhere between $99 and $199. Once signed up, FreedomPop subscribers will get unlimited SMS texts, 200 minutes, 500MB of free mobile data per month and free mobile-to-mobile calling to the company’s other subscribers. More minutes and data are available for a fee – prices start at $10 for unlimited calling and about $18 for 2GB of data. The service operates using Sprint’s WiMAX data network, which means service will be noticeably slower than the superior 4G speeds offered by major carriers. And even then, using FreedomPop’s data network at its full, slower speed will cost you an extra $3.99 per month. Still, with all the extra bells, whistles and fees attached, FreedomPop’s cost comes in well under that of its competitors. If you depend on your cell phone for work, then you’ll probably want to keep your premium wireless plan – a bargain-priced plan from FreedomPop or a competitor like Zact isn’t for you. But if you’re looking for a low-cost alternative to traditional cellular contracts, FreedomPop offers a terrific way to keep your family connected at the very reasonable price of absolutely nothing. You should be ashamed of yourselves for accepting this commercial to be published on your site. Until now, I have come to regard Techlicious as a good, unbiased source of information and advice. And now this! I am techy enough to figure out that this is not a true cell-phone; it’s a wi-fi device that can make telephone calls through the internet. Most of the target audience will not recognize this, although the specifications of the phone on the FreedomPop website don’t include anything other than a couple of wi-fi protocols for connectivity. When you say “there are a few catches” you don’t point out the biggest gotcha, which is that nobody will be able to use this phone unless they are already connected to a wi-fi spot. Just walking down the street, this phone is utterly useless, and you owe it to your readers to tell them the truth about that. This unprofessional behavior really taints all the rest of your “advice.” Can I ever again believe anything I read on Techlicious? First of all, this is a news story from two years ago about FreedomPop’s launch, not a commercial. However, I assume you are referring to a FreedomPop promotion we ran in today’s newsletter, so will respond to that. FreedomPop phones use Sprint’s network for making calls and for cellular data. You can use them anywhere Sprint’s network is available, in addition to WiFi. The Galaxy S III that was part of the promotion is NOT WiFi only. The specs simply didn’t list the cellular radio protocols. We personally evaluated the FreedomPop service before we agreed to run a promotion with them. I set up my 11-year old son on FreedomPop about a month ago with the basic plan where he gets 200 minutes of talk time and 500MB of data for $0 (yes, completely free). The phone works over both cellular and WiFi and it costs us nothing for service. Another factor we considered with the promotion is that FreedomPop is offering a 30-day money back guarantee. So if you’re not happy with the phone or service for any reason, you can return it. And if the phone were being misrepresented in any way, we would want to hear about it so we could address that with our sponsors. Finally, while we go through the steps of evaluating sponsors before we agree to run a promotion (how many other sites do that? ), promotions are not the same as our news or advice stories. Promotions are, by their very nature, ads and we disclose them as such. I hope this helps clarify the matter for you. And now, another year later, is it still free? Is FreedomPop still available these days and is it still free? And Since Boost Mobile uses the Sprint network, would I be able to use a Boost phone that is no longer on service, instead of a Sprint phone?